The company ‘RMI-Pharmacokinetics’ was founded in 2007 by the owner, Dr. Bob Ings, and was originally based in Redwood City, CA, USA, central to the Bay area biotechnology community. 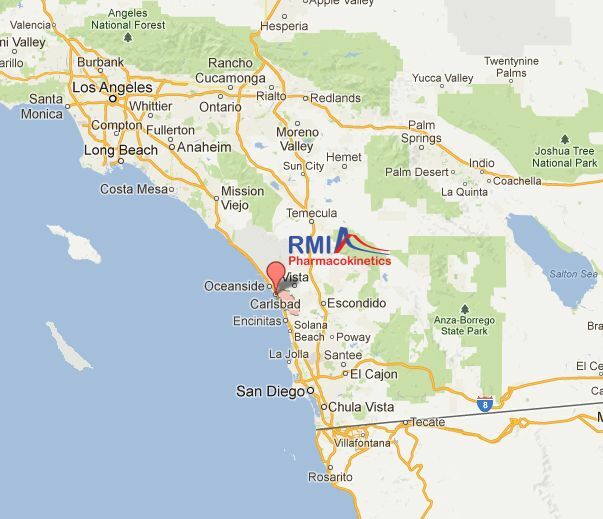 In 2008, RMI-Pharmacokinetics became a Limited Liability Company (LLC) and in the year 2010 RMI-Pharmacokinetics relocated to Carlsbad near San Diego, CA, USA, another major hub for the biotechnology industry. Carlsbad is a coastal city north of San Diego and south of Los Angeles accessible by air from the international airports of San Diego (SAN) or Los Angeles (LAX), by road (Interstate 5) and by rail. It is central to the innovative and vibrant biotechnology communities of both San Diego and Los Angeles. Also, in the vicinity, there are a number of internationally renowned Research Institutions and Organizations that promote and cultivate the innovation necessary for a biotechnology industry to thrive. These include UCSD, UCLA, the Scripps Research Institute and the Salk Institute for Biological Sciences. Since its inception, RMI-Pharmacokinetics has shown rapid and sustained growth that has now served many clients, encompassing a wide variety of therapeutic areas including CNS, cardiovascular, metabolic diseases, anti-inflammatory, oncology, anti-bacterial and anti-viral agents. The cliental represents a truly global reach, extending from the West coast to throughout the US, Canada, Europe and Asia. The services include training, development of drug discovery/early clinical development strategies, their implementation, issue solving, pharmacokinetic modeling, preparation of due diligences for partnering, preparation of regulatory documents (CTDs and INDs), as well as planning and implementation of full development programs. This is in line with the mission of the Company, which is: ‘to provide high quality consultative services on pharmacokinetics & drug metabolism, including data analysis, data interpretation, issue resolution, strategic planning, due diligences and training tailored specifically for the industry’. The cliental has and continues to include biotechnology companies, the pharmaceutical industry, contract research organizations and venture capitalists.